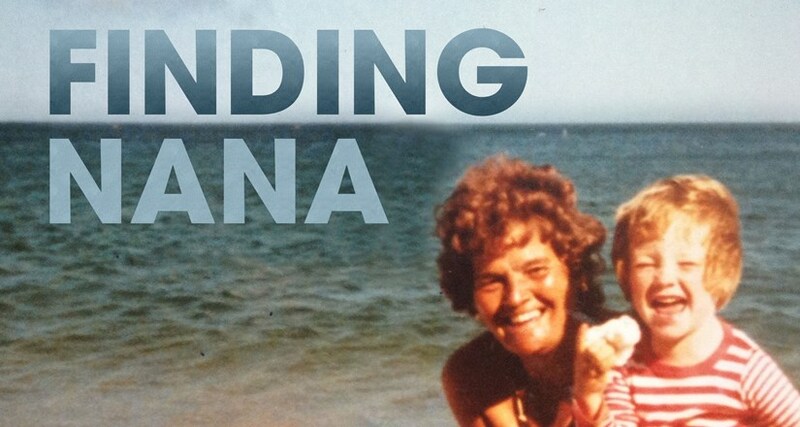 Review: Finding Nana. Nottingham Playhouse Neville Studio. – East Midlands Theatre. Review: Finding Nana. Nottingham Playhouse Neville Studio. Jane Upton’s one act play, Finding Nana, is an incredibly engaging poetic narrative on the subjects of loss of a loved one and memory. It is witty both in text and exposition and cleverly intertwines the strands of the autobiographical story of Upton’s love of her Nana as well as her decline into dementia and eventual death. The hour long play does us the intelligent service of delivering the story in a non-chronological way, dipping and diving into treasured and not so treasured memories as they bubble up to the surface of the tale. We discover Jane (Stacey Evans) on the single bed that acts mostly as an actual bed. 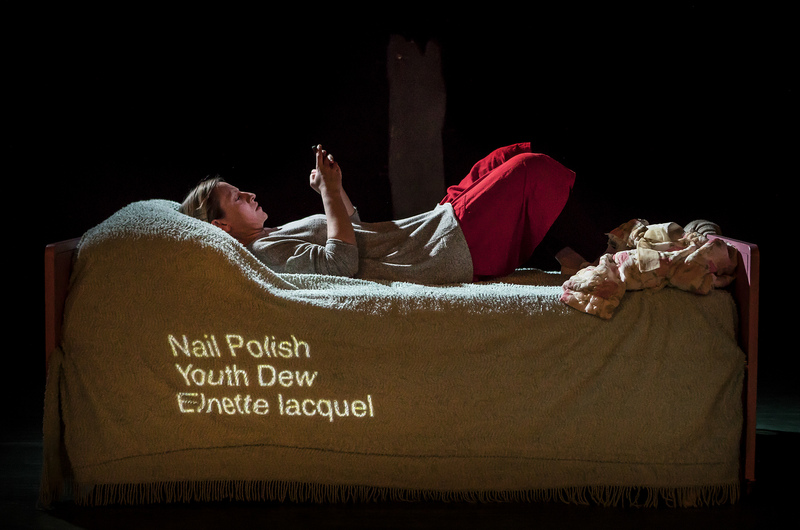 As she sits on the bed with her mobile phone a myriad of words associated with her Nana are projected on the duvet as she types. Words such as nail polish, salt and celery, powder puff, pink dressing gown, Mr Whippy with flake, liver spots, Countdown and Wilko’s seeds. The transient stuff of connection and communication embodied in the ordinary made extra-ordinary and magical. Later in the story the bed becomes a solid metaphor for the journey across the dark waters of recall as Jane re-visits the old holiday hotel on the Isle of Wight where she spent 25 idyllic years with her Nana. 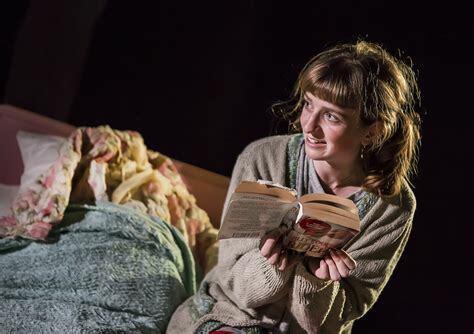 Stacey Evans plays Jane with a bright vigour and youthful enthusiasm; a tangible happiness to voyage into the surreal and at times, become her Nana, as she asks about the, then, boyfriend Adam. Evans’s performance is instantly likeable and believable and in being both we are willing to follow her adventures through Upton’s clever text and director Katie Posner’s sterling creative direction. The whole is a very moving and yet uplifting autobiographical tale through which anyone who has experienced such love and loss cannot fail to empathise. The very elusive nature of memory is also considered and how the things we think are memories are often memories of themselves or part remembered happenings given new interpretations by the mind. In this concern Jane Upton takes us from a simple story of a woman who loved her Nana into finding something much deeper in the experience. 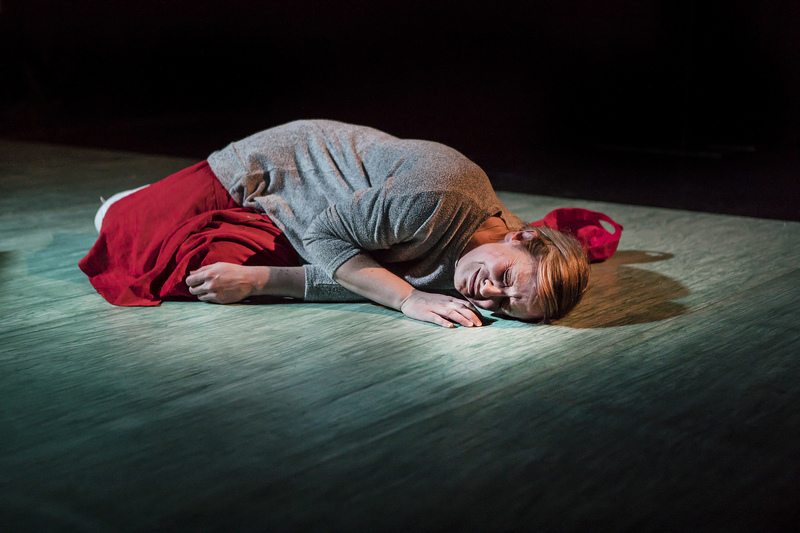 New Perspectives produced Finding Nana is a terrific stage show that engages and elucidates. Runs at Nottingham Playhouse studio until Feb 10th and tours. Review originally written for Nottingham Post. Review: Nina. Curve Theatre Leicester.